1 : Using a colored eyeliner pencil first draw an outer demarcation above the crease area. We have used a bronze colored pencil from an ordinary brand. 2 : Then start shading inside using the same pencil and apply the color uniformly all over the lid. 3 : Use the pencil in slanting motion & try to blend the eye shadow to create a softer look at the crease area.This is the blending process and this is done only using the pencil and not any brush. 4 : Using the same pencil, line your lower line and extend it towards the outer V area. 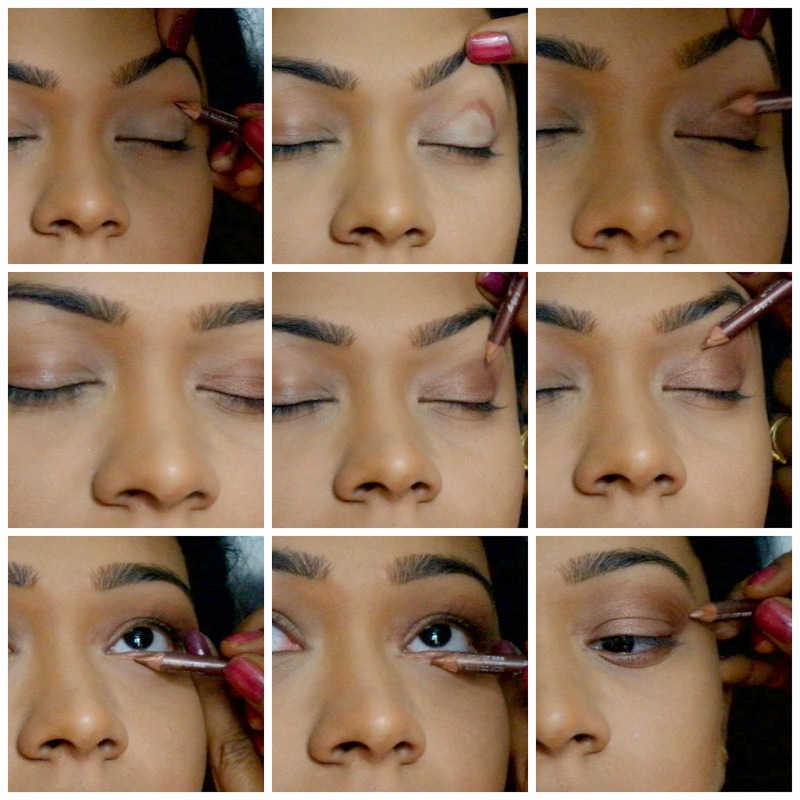 5 : The first picture above shows how it looks after blending the eye shadow. 6 : Next take a black khol pencil and draw a thick line on upper lash line. 7 : Take another colored liner and lien the lower lash line to create a dramatic look. We used Maybelline Liner in green. 8 : Then using the black khol draw a thick line on the lower lash line for an intense eyemakeup look. 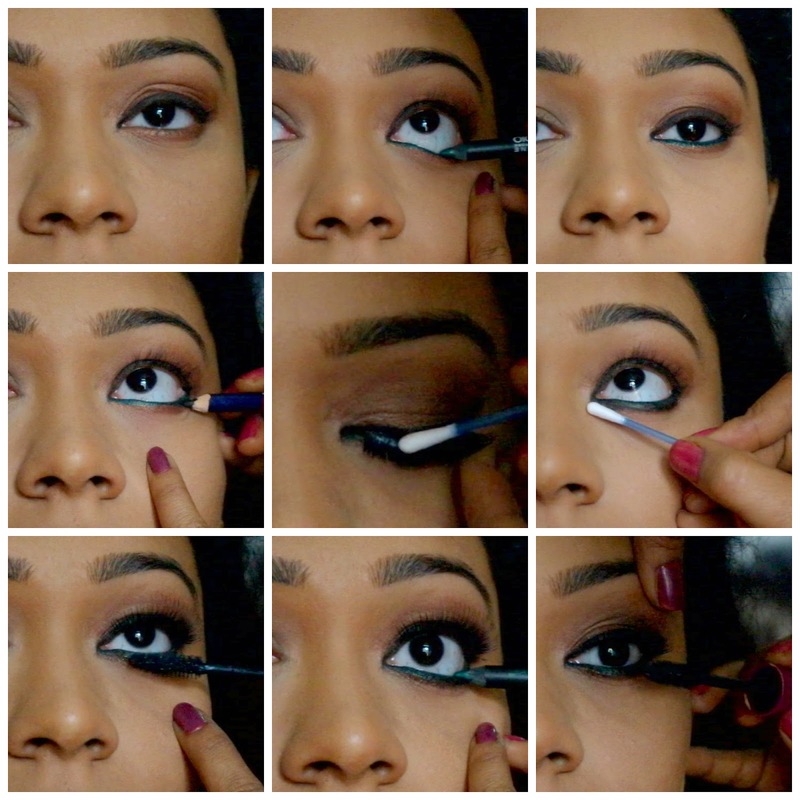 This is an optional step.I feel incomplete without black khol on my lower lash line. 9 : Apply lash glue to the false lashes, stick them & use a Q tip to make the false lashes stick to your natural ones. 10 : Apply mascara to both upper & lower lashes, touch up the lower lash line with green liner. Do all the clean ups using the Q tip and see the final look below..
1 : If you find blending of the eye shadow at the crease area difficult using the liner pencil, you can use the Q tip to smooth out the harsh edges. 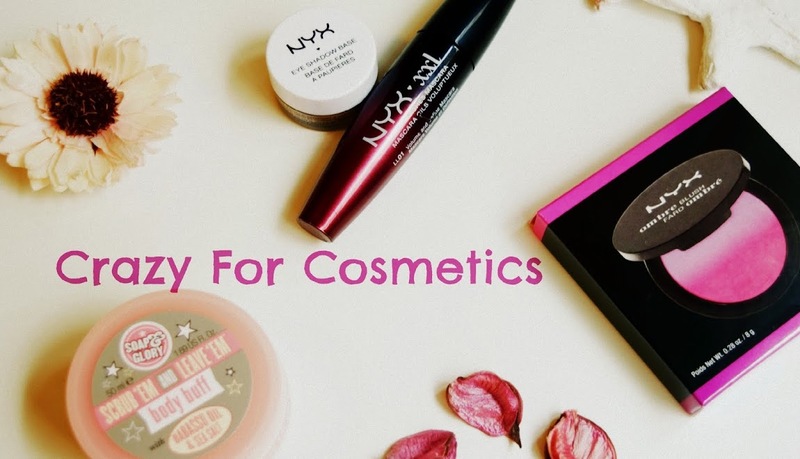 2 : Take a small amount of talcum powder on the Q tip & press it on the lids after completing the look so that it doesn't smudge & stays in tact for a long time. 3 : A cream based concealer is sufficient to act as an eye shadow base and there is no need to invest in a separate primer. She used Kryolan dermacolor camouflage cream on my eyes. Kavitha has over 15 years of experience in Bridal makeup and she has done Movie Special Effects certification from Kryolan Mephisto Professional Academy. She charges around INR 6000 for bridal makeup.She does travel outstation provided her accommodation & travel expenses are taken care of.She charges around 10 to 12 k if she has to travel outstation for bridal makeup. I personally would say Kavitha does excellent hair style & setting.She has a free trial session too.